Virginia “Jackie” Pearl Hinton, age 85, was born December 30, 1933 in Raymondville, Mo. to Everett and Agatha (Patterson) Barton. She passed away March 5, 2019 at Houston House, Houston, Mo. Jackie married Leroy George Hinton February 2, 1952 in Salem, Ark. They had two sons, Micheal and Gregory. She worked for over twenty-five years at Rawlings before retiring. She also worked in Home Healthcare for several years. Jackie was baptized at the age of 15 in Big Creek while attending the Church of God. She faithfully attended church until her health began to fail. Jackie was preceded in death by her parents; her husband Leroy; a son, Micheal; four sisters, Emogene, Ruthene, Sally Anne and Phyllis and two infant siblings. 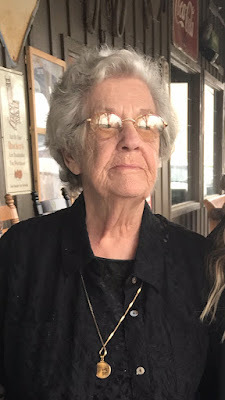 She is survived by a son, Greg Hinton and wife Loretta of Raymondville; three granddaughters, Brandy Mullins and husband Tommie of Conway, Ark., Bo Hinton of Ashland, and Chelsea Hinton of Raymondville and Chelsea’s best friend, Laney Ness who spent countless hours over at grandma’s house with her; three great-grandchildren, Hannah and Ava Mullins, and Elexis Drury; two sisters, Lola McCall of Texas, Ethel Brown and husband Lawrence of Valley Park; a sister-in-law, Norma Hinton of Houston; and a host of nephews, nieces and cousins. She enjoyed quilting, fishing, playing cards, puzzles and playing dominoes with anyone that would play and her grandkids. She also enjoyed her scratchers…. Jackie had a talent of patching blue jeans where the patch would out last the blue jeans. Anyone that knew her would agree that you knew how she felt on any subject. Jackie will be missed by all who knew and loved her. Memorials may be made to Boone Creek Cemetery in lieu of flowers. You may go to www.evansfh.com to express online condolences. Services were held Saturday March 9, 2019 at 11:00 a.m. at Evans Funeral Home with Rev Dorvan Stringer officiating. Burial was in Boone Creek Cemetery under the direction of Evans Funeral Home. Pallbearers were: Guy Ceplina, Tim Ceplina, Jerry Spencer, David Scantlin, Jay York and Larry Miller. Honorary Pallbearer was Justus Wilson.